One of the biggest street style trends for Fall/Winter 2016 is Bold Braids, and we spotted them everywhere at February's New York Fashion Week. From boxer braids to boho braids – via a cute heart-shaped braid tied with a bow – this look was a clear winner among the style elite. Taking the bold braids street style onto the runway, TRESemmé lead stylist Jeanie Syfu braided pretty fishtails over romantic flowing waves for Rachel Zoe’s FW16 show at New York Fashion Week, with wispy half-up hair giving models an ethereal look. The mostly white collection featured lots of furry fabrics, sparkle, and lace creating a Snow Queen feel befitting of the season. And what better hairstyle for a Snow Queen to wear than a crown of beautiful bold braids? We loved how Zoe also showed that bold braids can transcend eras, as her collection merged 30’s flapper-style tassels with 90’s turtle necks. And while her collection was spiked with glamor – it's Zoe's signature, after all – this pick of the fall 2016 hair trends leant a touch of undone charm to bring the whole look into truly covetable territory. Want proof? While bold braids looked stunning on the runway, this show-stopping style is a dream mix of beauty and practicality that works brilliantly on the street, too. Backstage, TRESemmé Style Setters reporter Louise Roe spied bold braids everywhere – including a gorgeous Rachel Zoe-esque boho-braids-over-waves look on blogger and actress Meghan Rienks. Another similar look we spotted on the street was the braided wave, where a side braid and wavy tresses are pulled back into a ponytail for a cool and casual look. 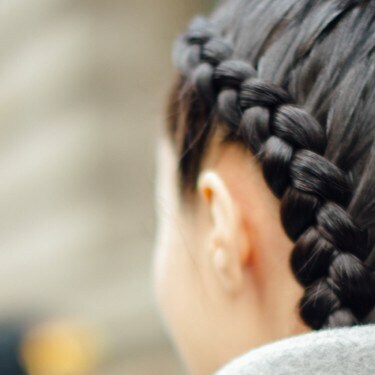 Or, for a smarter, more polished way to wear braids, the Double French Braid will ensure there’s not a single hair out of place, making it the perfect plaited style for the gym. Tip 1: Use a curling iron on hair first to get a roundness that helps the braid lock into itself easier. Genius, right? Tip 2: Hair spray is essential for getting braids to hold. Spritz your braid with your favourite hair spray to finish the look and smooth down any stray flyaways. Tip 3: Hold the braids tight and use bobby pins for any loose tresses. Whether you go for a braided half-up 'do, braids with waves, French braids, fishtail braids, or a different way to wear braids entirely, make sure your braids are bold to tap into this hot Fall/Winter 2016 trend.